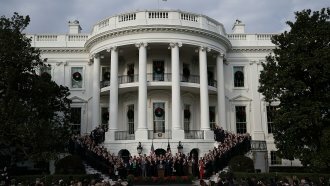 President Donald Trump signed Republican's sweeping tax overhaul bill into law Friday morning. Both the House and the Senate passed the tax plan earlier this week. The $1.5 trillion tax overhaul will lower the corporate tax rate from 35 percent to 21 percent. It will also lower individual tax rates and almost double the standard deduction. Trump also signed a short-term spending bill, preventing a government shutdown and extending funding through Jan. 19.